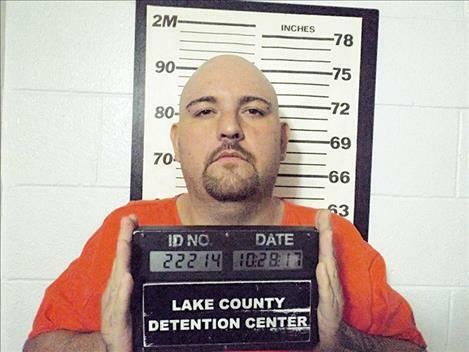 POLSON – A 32-year-old Polson man accused of exposing two small children, ages 11 months and 5 years, to methamphetamine and assaulting the 11-month-old, entered a plea agreement with Lake County prosecutors that could result in no more jail other than time served, about two weeks. Joseph Matthew Farris offered an Alford plea in Lake County District Court on March 7, to felony charges of endangering the welfare of a child and assault on a minor in exchange for a tampering with a witness or an informant charge to be dismissed at sentencing. In an Alford plea, a defendant concedes the case based on state’s evidence without pleading guilty. In a plea agreement under Montana State Law, the defendant must acknowledge the agreement is in the defendant’s best interest. According to court records, the Department of Public Health and Human Services, along with Child Protective Services from both Lake County and the state of New Mexico, where the family previously lived, received numerous reports of abuse or neglect against Farris and the children’s mother, Charlene Sheehy. The reports involve violence between the parents, drug abuse, excessive and inappropriate discipline, lack of supervision and emotional abuse. The children were eventually removed from the household by social services. Court documents state the 5-year-old told her foster mom that “mom and dad do meth with kids in the house, and I have asthma.” Records further state the 5-year-old said Farris threw the 11-month-old over a television set. A CT scan taken on Aug. 16, 2017, showed the 11-month-old suffered a (brain injury) traumatic fracture to the posterior occipital lobe of the brain. The injury was estimated by medical staff to be “three to five weeks old.” Charging documents also show the younger child had to be treated for drug withdrawal in July of 2017. A hair sample of the 5-year-old tested positive for methamphetamine. Lake County prosecutor Ben Anciaux is deferring the prosecution of Sheehy saying Farris was the more culpable party. Sentencing for Farris is set for April 11. The plea calls for a joint recommendation (state and defense) of sentencing being deferred for three years. Both parents will have to abide by the conditions of their respective deferred agreements. The children are in custody of extended family.